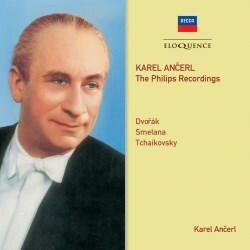 Eight years into his role as artistic director of the Czech Philharmonic, Karel Ančerl spent some sessions recording with the Vienna Symphony which was at the time still presided over by von Karajan. The repertoire was Dvořák and Tchaikovsky, with the addition of Vltava (only) from Má Vlast and the sessions stretched from March 1958 to February 1959. Familiarity with Ančerl’s Supraphon discography has perhaps tended to obscure these performances, all released on Fontana, but the results more than justify their re-issue now on this 3-CD set. Dvořák’s New World was a staple of his repertoire and multiple examples exist both studio-based and live. The VSO performance, characterful and lissome, can be contrasted most notably in its slow movement which is taken at a relatively brisk pace if one knows the 1961 Prague reading or even the 1959 live Ascona one. Indeed, when the conductor brought the Czech Philharmonic to Vienna in 1956 – two years before his VSO recording - his performance was also significantly slower in the Largo and brisker in the finale. Given this sense of small but distinct change of proportion, this VSO reading will be of real interest to Ančerl collectors. This first disc concludes with the Op.46 set of Slavonic Dances, rhythmic alert, sonically quite lean and never heavy, and always stylish. He recorded both Op 46 and Op.72 with the Berlin Radio Symphony but the Vienna performance is more stylish and pointed, its avuncular and insouciant qualities (try No.6 for an example of the latter) prominently audible. The second disc opens with a well delineated Vltava and continues with an elevated Tchaikovsky Romeo and Juliet. It’s not a galvanic reading but gains in a kind of noble patina, an unwillingness to milk the emotional maelstrom of the music. It’s true, as Rob Cowan points out in his excellent notes, that the timpani rolls are ‘feeble’ but this is the only demerit. A similar quality of watchful expressive restraint marks out the Fourth Symphony which is played with a linear intelligence that doesn’t ignore the music’s expressive outpourings but balances them. Cannily avoiding the temptation to drive onward - or the obverse temptation to smell roses - the Czech conductor reserves outbursts for the optimum expressive and architecturally cogent moments. The Marche Slave fills out this second disc powerfully. The last disc is largely balletic. The Swan Lake suite is another example of his modified romanticist instincts in this repertoire, though he is full of joie de vivre in the Waltz and pliant in the Dance of the little swans. The fourth tableau, the Scene, features splendid playing from the harpist and cello principal and above all from the VSO’s concertmaster – I assume Walter Schneiderhan. The Sleeping Beauty Suite is equally attractive - and it too sports another vigorously dispatched Waltz – but perhaps the pick of the ballets is The Nutcracker, a performance of real imagination and sense of sonic colour with a dapper March – beautifully balanced pizzicati and winds – and a real sense of character throughout. The VSO is on top form. And one shouldn’t omit the Valse from the Serenade for Strings – no Mengelbergian or Stokowkskian personalisation here – and the 1812, where bass drum, and not dubbed cannon, hits the mark. These stereo recording transfers sound excellent and the CDs are pretty much packed to the rafters.